You can now get the online equivalent of me privately mentoring you by equipping yourself with my library of 21 “already done for you” advanced hypnosis masterclasses. These 21 advanced hypnosis masterclasses cover the whole field of hypnosis. Everything you want to know… every question you want answered… every nuance you want explained is covered in at least one or more contexts within the library of 21 masterclasses. The library of 21 masterclasses can be used as an at-hand “dip in resource” you can go to, to get any hypnosis-related question answered or any issue or confusion cleared up. You’re only ever as good as the information – the knowledge – you have access to. And, in the field of hypnosis you will not come across better taught, better organized and systemized information than the training, instruction and demonstrations found in my advanced masterclasses. Again, you don’t have to go through all the masterclasses from start to finish to benefit from them. The idea here is that you can access any of the masterclasses – at a moment’s notice – whenever you have a hypnosis-related question you need a ready answer to or a confusion you need clearing up. And because you will get all 21 masterclasses in digital online format, they can all be sitting on your desktop computer, laptop, tablet or phone for instant access within just a few minutes from now. 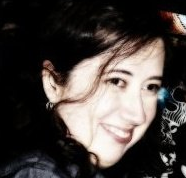 You'll literally have the best information, answers, demonstrations and simplified explanations on a huge range of hypnosis topics and techniques. Don’t get me wrong. There are some excellent hypnosis books out there. I recommend some of them. Information in books can be very one-dimensional and, you and I both know reading books can be very time consuming and require hours and hours of uninterrupted study. ...there’s no feeling of being let down by “book knowledge” that leaves you with more questions than answers when it comes to actually applying a hypnosis technique in a real-life situation. Many hypnotists need different strategies to deal with clients who need multiple hypnosis sessions to fix their issues. And my masterclasses give you that in spades! And that's not including all the "inner-hypnotist" strategies I also cover too! "How To Use The Unconscious So People Forget How To Resist You"
In this first session you'll discover the basic framework of the "Non-Awareness Set" and the keys to getting the results you want. One of those keys is to ensure that the person you are talking with is involved with what's happening. That means you need to set the scene correctly and neutralize any open skepticism or hostility. An astonishing demonstration of the Non-Awareness Set where a person's hand gets heavier and heavier until it is glued to their laptop computer! How to have someone go into hypnosis whilst still alert and talking to you and giving you constant feedback as to what is happening inside them. It's like being able to see into his mind - No more guess work! Discover how to create a "disobedient hand" in your hypnotic target. This may sound incredible but here's a demonstration where someone really cannot control their own hand! How to make "resistant answers" to your questions the best damned trance inducing agent in your entire arsenal. They cannot resist this - it'll blow the doors to trance wide open! Hypnotic Jujitsu. How to use the power of someone's "resistance" to demolish that resistance! By the end of this first session, you'll most likely be stunned at the number of jaw-dropping "Ah-ha" moments. 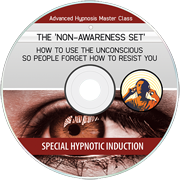 You'll know how the "Non-Awareness Set" makes possible a whole new world of hypnotic power and effectiveness. In this next section, you'll take your new skills, refine them and add them to your existing hypnosis powers to reach a new level of effectiveness. 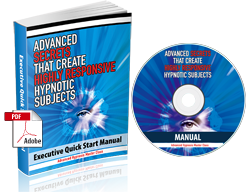 How to use my 4 Stage Hypnotic Protocol for hypnosis with the Non-Awareness Set to create your roadmap to hypnosis success. I think you'll be amazed at what's possible for you with the Non-Awareness Set. This final session is all about the most advanced ways to use the Non-Awareness Set and making your hypnosis effortless and effective. My "Hypnotic Alchemist Technique". Easily transform resistance into assistance! Plus, to conclude the program there's comprehensive, step by step guide to putting the Non-Awareness Set to work for you in every conceivable situation. 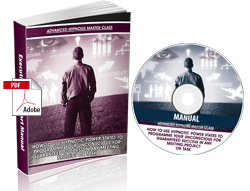 Now, as well as the audio sessions, you also get a "Executive Quickstart Manual" in PDF format that recaps the key points from the class. It also gives you an easy way to refer back to a particular section at any time. "It Is An Extremely Powerful Tool"
“I studied "The Non Awareness Set' Master Class for several days while traveling to Las Vegas. On the second day in Las Vegas I used these techniques to hypnotize a bar tender right after he told me he did not believe he could be hypnotized if he did not want to be. "How To Tell Spellbinding Stories So That People Hang On Every Word You Say As They Slip Easily Into Hypnosis"
One of the keys to being a great storyteller is being able to come up with a seemingly endless source of new, fresh and exciting ideas. Now, every one of us has vast reserves of creativity available to us. The trick is tapping into that creativity when you need it. It's easier than you might think when you know the simple secrets that I reveal in this first session called "Creativity and Spontaneity"
Story Exercise #1. Take what you learned from the mind games and practice bringing them to life in story form for the first time. The same way you'll use them to captivate small groups later. BONUS: Apply your hypnotic storytelling methods to the written word so you can hypnotise people with your emails or online chats! With the skills you'll possess at the end of this session, you'll always have the right idea for a story whenever you need to capture attention. Of course, your expanded creativity and spontaneity will benefit you in all areas of your life, not just when you're using hypnosis. Now it's time for you to joint the ranks of great storytellers. There are some simple secrets to telling captivating, powerful stories. You'll have them after listening to this second session. With you new storytelling skills, you'll be amazed at how easily you can attract and hold people's attention. You'll find people drawn to you and open to your influence. In this third session ("Hypnotic Storytelling") you discover how to take your already powerful stories and transform them into virtually irresistible tools of covert influence. By adding hypnotic elements to your stories, you'll have listeners quickly falling under your spell. With the combined power of compelling stories and hypnosis, you'll reach new levels of covert influence. Imagine what you can do with this new power. Of course it goes without saying to act ethically and responsibly! Now, as well as the audio sessions, you also get a "Executive Quick-Start Manual" that recaps the key points from the class. It also gives you an easy way to refer back to a particular section at any time. And that's not all. Because you also get. "Anyone In Sales Or Dealing With The Public Will Benefit From This"
“As a Speaker, my income depends in a great way on my ability to blend learning lessons into stories. "After purchasing and learning Igor's master Class "Spellbinding Stories" my income climbed and continues to climb. 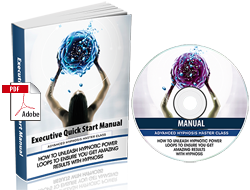 "How To Unleash Hypnotic Power Loops To Ensure You Get Amazing Results With Hypnosis"
You see, what I call "Hypnotic Loops" are the individual elements of the hypnotic process (for example, inducing trance is one Loop). And "Power Loops" are how you combine individual Loops to create the result you want. 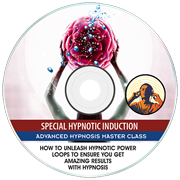 In this first session of the "How To Unleash Hypnotic Power Loops To Ensure You Get Amazing Results With Hypnosis" Master Class, you'll really master these fundamentals. You'll understand at a deep level how any hypnotic process works and, more importantly, how to create your own unique and potent combinations. The second session is called "The Structure Of Mini Loops And Hypnotic Sets". It's all about building on your new skills and creating a special kind of Power Loop called a Hypnotic Set. Hypnotic Sets are very important and very useful to you. This is because they enable you to use someone's actual experience and memories to get the result you want. With the extra abilities you get in this second session, your range and power as a hypnotist will expand dramatically. And to complete the picture. In this third session ("Thinking Strategically And The Top 10 Power Loops") you draw on what you've discovered so far to create your own library or repertoire of Power Loops. A set of unique Power Loops you can use to achieve specific results. At the end of these 3 sessions, you'll have a deeper understanding and command of hypnosis than even some so-called experts. Even better, you can use your new command of the fundamental building blocks of hypnosis to be more accomplished and effective. Now, as well as the audio sessions, you also get a "Executive Quickstart Manual" that recaps the key points from the class. It also gives you an easy way to refer back to a particular section at any time. 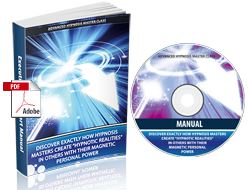 "Discover Exactly How Hypnosis Masters Create “Hypnotic Realities” In Others With Their Magnetic Personal Power"
This program is most definitely a “game changer” for aspiring (and even experienced) hypnotists. 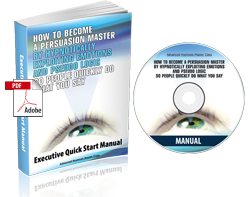 It will literally give you a commanding presence with your hypnosis clients and subjects – you DON’T need to start barking orders at people or acting in any way too different to how you are now. You just have to know how to exude a strong personal authority. The kind of personal authority other people will pick up on the moment you walk into a room or without you even saying a word. In this first session, you'll discover the fundamental principles to building your personal power. And the first step is to make some simple changes to your own behaviour. With the simple steps outlined here, you'll already be more in control of events. You'll also find people will see you differently and be more open to your influence. In this next session we look at exactly how to prepare in advance so that when you conduct a hypnosis session you're virtually guaranteed a successful outcome. This is what is I mean when I talk about creating a "Hypnotic Reality". By following these steps, you'll find people will have no desire, or ability, to resist when you start a hypnotic session. And that's even without knowing. In this third session, you go beyond simply applying techniques and move forward to creating personal power that makes it almost effortless to get what you want. The surprising lesson about Personal Power that you can discover from...a baby! At the conclusion of this Master Class you'll have the secrets to using your new personal power to virtually guarantee success when you hypnotize someone. "It Makes It Much Easier To "Hold State" So That Folks Trying To "Break State"
￼ "Very very good class, useful for much more than just Hypnosis work. It allows you to hold your own "reality bubble" around yourself, influence others yet hold your own "shields up". Fantastic to enable fair negotiations or hold your own against people equally skilled yet without your best intentions in mind. It makes it much easier to "hold state" so that folks trying to "break state" for you can't. It's also a good way to indirectly influence people, you can believe in the best qualities of them so strongly that they simply give up trying to do otherwise, and let those qualities out." "The Stunning Secret Of Covert Trances That Will Have You Changing People’s Minds More Often Than You Change Your Socks!" A little known fact is that covert trances happen naturally all the time. In many cases, someone will be in a trance without even realizing it. They can be stuck in a rut and that's often the cause of a problem. As a hypnotist, with this understanding, you're in a position to help people get out of this rut. To expand their choices - including of course what you recommend. With your new insights and skills from this first session, you'll already see problems and challenges in a new light. You'll already be more effective at finding solutions. In this second session, you take your skills further and really start to master the art of using covert trances for problem solving. By this stage, you'll probably find yourself seeing solutions to problems that baffle others. I mentioned earlier that I was a top-notch corporate troubleshooter. And part of the reason for his success was that he discovered and refined what he calls the SPiRITS formula for change and problem solving. In this third session, you'll discover what goes in to the formula and how to use it for powerful results. Warning! Master hypnotists know this is a myth. Don't fall for it! You'll now have everything you need to be a master problem solver and agent of positive change. "Being Able To Help People Without Their Knowledge"
“You'll never speak again without considering what you've said. The power of words has such immeasurable power and Igor shows us how to use them to both our and their advantage. Being able to help people without their knowledge. "How To Use The Distraction Method To Secretly Influence People’s Unconscious Mind To Give You What You Want." In this first session you'll find out why distraction methods are so effective and some of the ways you can use them. This session is all about the secret to using distraction methods successfully. Armed with the knowledge contained in this session, you'll know the right way to use distraction methods. And you'll avoid potential blunders. As a hypnotist, you're likely to find yourself influencing people by helping them with problems or issues of personal change. And distraction methods can play a big role in making breakthroughs. You'll find that distraction methods will add a new dimension to your ability to help and influence people. “For myself I use the power state exercise every day. Last Monday in a session with a client I felt small kicks when it was important to change direction. One of my favorite masterclass is the ""distraction method"". "Uncover The Secrets Of Naturally Developing Irresistible Suggestions"
This program is the closest thing to “rewinding the clock” and learning directly from Dr. Milton Erickson himself. Anyway, here are a few of the secrets you’ll discover (and be able to use) when you get it.. In this first session, you'll find out about the special way you can use language to "set the scene" ahead of your hypnosis sessions. Poets and great orators throughout the ages understood the power of words to make an impact and shape people's emotions and actions. You'll have this power yourself. With your new command of hypnotic language, you'll find a new flow and poetry to your work that will produce results smoothly and elegantly. 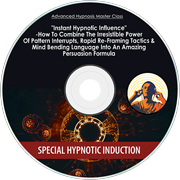 In this next session you'll take hypnotic language and build sets of irresistible suggestions that you can weave into any conversation, presentation or hypnosis session. Warning! There's a correct way to use suggestions. If you forget this, you'll come across as socially inept or even mentally deranged! You'll find when you use these irresistible suggestions that people will naturally follow your wishes. 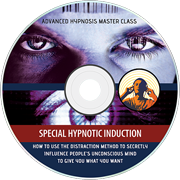 In this final session, you'll take your covert hypnosis skills to a completely new level. People will think that they are following their own ideas when in fact they are doing exactly what you want them to do. 7 examples of how to subtly influence people's behaviour (some without having to say anything).plus an example of what not to do! This really is one of the highest skills of covert hypnotic influence. Influencing without appearing to influence. You'll be a member of a small "Ninja" elite who have this remarkable power of making suggestions undetectable. 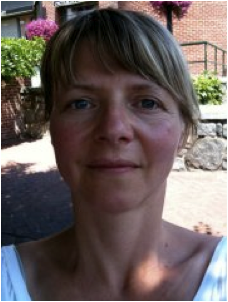 “Thank you Igor, the irresistible suggestion masterclass offered me a great way of developing my hypnotic language through some principles and a very important exercise to make my hypnotic language natural, and almost effortless to create. This masterclass is like a natural “mind drug”. Turning you “ON” at will. And when you’re “in the zone” you literally become “untouchable” to any kind of competition. Nobody can live with you when you’re in the zone! This first session covers the fundamentals of "State Control" - how to be in charge of your emotions at any time. It's critical to control how you feel because this will influence how you think, speak and behave. ...plus simple but powerful tactics to make the "Unconscious Success Drill" easy to master. In this next session you'll get the keys to "The Zone" (also known as being in the "Flow"). With your new skills and powers, you can get into "The Zone" and apply your full hypnotic power whenever you desire. And to complete your new range of skills. In this session we take the next step and focus on how to acquire new skills and knowledge in the fastest possible way. New worlds will open up to you with the ability to easily learn new skills and acquire advanced knowledge. "I Achieve Fantastic Results In A Fraction Of The Time That I Used To"
“As a Sales Professional I hold many meetings with customers and staff alike. This program has been a powerful influence in how I now present and run meetings. The structures, planning and flow of meetings are so seamless now that I achieve fantastic results in a fraction of the time that I used to. Not only that, the focus is so intense there is often no resistance from others or time wasting any more. 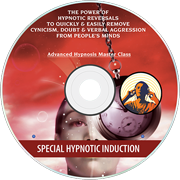 "The Power Of Hypnotic Reversals To Quickly & Easily Remove Cynicism, Doubt & Verbal Aggression From People’s Minds"
In this first session you'll discover the power of Hypnotic Reversals. They are like a verbal "Aikido" you can use to neutralise challenges and attacks. You can then gently bring the other person over to your side. After all, your aim is to skillfully influence. It's not about winning an argument while leaving the other person sullen and resentful. With Hypnotic Reversals at your command, you'll easily be able to deal with most challenges you encounter. And for more difficult situations. In this second session, you'll build and refine your new skills so that you can confidently address even the toughest challenges. From now on, you can face even the most confronting situations with no concerns. In fact, you'll probably smile to yourself because you'll know exactly how to turn events to your advantage. And there's one further way you can make use of your new skills. Even if you don't regard yourself as a salesperson, the reality is that in some way you're involved in selling. Getting new clients or a new job, negotiating any kind of deal are all examples of selling. So understanding how to sell is a valuable skill and in this session you'll discover the Ultimate Sales Formula using Hypnotic Reversals. How to quickly build trust and make people feel comfortable around you with the "Instant Rapport Technique"
Warning! Don't do this or you'll come across as a shifty, low-life politician who has something to hide! Whether you're in sales full time or not, the Ultimate Sales Formula can help you skyrocket your results. Now, as well as the audio sessions, you also get a "Quick-Start Executive Manual" that recaps the key points from the class. It also gives you an easy way to refer back to a particular section at any time. PLUS as a SPECIAL BONUS the Executive Quickstart Manual includes a 68 page transcript of a classic work called the "Gorgias". This is an extended conversation between the classical Greek philosopher Socrates and a number of different people trying to persuade him of different things. Don't pass over this simply because it's from almost 2,500 years ago. It's a tremendous example of how to use Hypnotic Reversals in a regular conversation. Socrates was a master of this technique and you'll gain a tremendous amount from observing and following what he does. 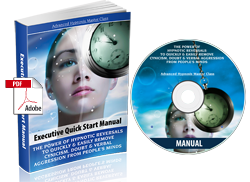 “Igor’s master class on hypnotic reversals is not only amazing for hypnosis but if you are in sales or even if you deal with difficult people. 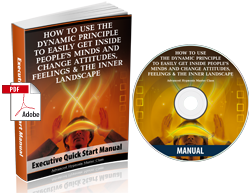 "How To Use The Dynamic Principle To Easily Get Inside People’s Minds And Change Attitudes, Feelings & The Inner Landscape"
If you want to “up your game” as a hypnotist there is no better program on the market to go through. This first session takes you straight into explaining the Dynamic Principle and how to use it in your own hypnosis work. Included is a complete example you can use as a template. Having introduced the Dynamic Principle, now we go deep and uncover the many ways to use this potent technique. You also get the benefit of a detailed analysis and set of tips from me (this is like you sitting in on a hypnosis session and "looking over my shoulder"). With your new skills, you'll be able to add extra power and impact to any hypnosis session. And you'll see better results because you'll be zeroing in on exactly the right pressure points that will make someone change. The first two sessions concentrated on applying the Dynamic Principle to direct hypnosis work. But you can also use the Dynamic Principle in conversational, covert hypnosis. In fact, it's probably even more powerful in such situations. The stories that people tell themselves shape both how they see life and what happens to them. Here's how to uncover those stories and be able to literally read people "like a book"
And the best part about using the Dynamic Principle this way is that people will have no idea what you are doing. 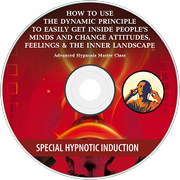 A Special Hypnotic Induction To Master The "Dynamic Principle"
"The Dynamic Principle Is Something I Use Every Day"
“The Dynamic Principle is something I use every day. 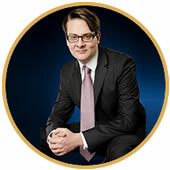 "As a writer and creative person who is fascinated by hypnosis, I've long known that people develop rich inner lives. "Creating a place for them to explore and interact with in new and interesting ways, is my bread and butter. "So to learn from from somebody who has dedicated their life to navigating and enhancing people's inner worlds is a wonderful opportunity. "The Dynamic Principle is a wonderful way to guide and shape yourself and others, to enable you to understand that the change you so deeply desire is just around the corner. "It opens doors to opportunity like nothing else I've ever seen, by allowing you to understand your own natural forms of communication and thinking, as well as that of those around you. "We've all heard that there are powerful metaphors for change. We've all heard that you can access your inner resources. "The Dynamic Principle as Igor teaches it provides you with a clear and easily understandable method for developing and understanding just that - the path and way that is uniquely yours. "Not only that, but you can help others find theirs as well! There's a reason it's called the Dynamic Principle - if you learn how to use it, then you'll never be 'stuck' again. "Now You Can Demonstrate The Power Of Hypnosis To Amaze A Crowd, Be A Force For Good Or Even Save Someone’s Life!" 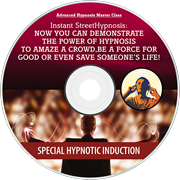 There’s no other “street smart” hypnosis program like it. Especially as I cover "Emergency Hypnosis". Street Hypnosis is the way you can use hypnosis anytime, anywhere, with anyone. Remember, hypnosis is something that's actually quite natural and happens all the time. Even if most people aren't aware of what's happening. You can take advantage of this both to improve your own life and to help other people (who will thank you for doing so). Plus a host of tips, tricks and techniques you can use in regular everyday situations. These will boost your prestige and influence and people will look at you with a new regard and respect. Now, you may never want to appear on stage or be a professional hypnotist. But few things are as effective in making you a figure of authority and influence as holding an audience spellbound with a Mini Hypnosis Show. So even if you only ever use this skill with small groups or friends and family, it will pay big dividends for you. How to give someone a wonderful experience of health, vitality and wellbeing. 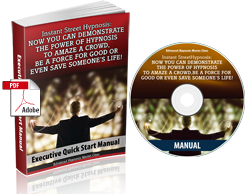 There's a simple 4 step formula that works like "magic"
This new skill will help with all of your hypnosis because of the added personal power it gives you. You may not realise it, but as a hypnotist, you are uniquely qualified to help in an emergency. Now, of course, the lead role will always fall to the official emergency services. But you can render valuable assistance in many ways and in some situations you may be the only help at hand. The knowledge and skills in this session could literally make the difference between life and death for a family member, friend or simply someone who was lucky that you were on the scene. You may never need to use these particular skills. But if the worst happens you'll be ready and able to make a difference. 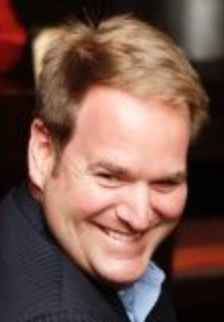 "...Insights Into Areas That I Would Have Never Thought To Venture Into"
￼ “This Master class gives you insights into areas that I would have never thought to venture into. 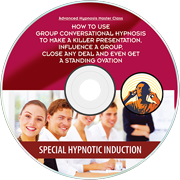 "How To Use Group Conversational Hypnosis To Make A Killer Presentation, Influence A Group, Close Any Deal And Even Get A Standing Ovation!" Or motivate an entire group of people to follow your cause. In fact, here are just a few of the secrets you’ll discover (and be able to use) when you have the program. Preparing correctly is essential for success in any endeavour and applying Conversational Hypnosis with groups is no exception. In this first session, you'll discover how the experts prepare so that they are on track for a successful result before they even say a single word. To Add Power To Your "Punch"
Why are some groups a pleasure to work with while others turn on you like a pack of rabid dogs? Why do some presenters always seem to get a "good crowd" while others face indifference or hostility? The answer lies in what's known as "Group Dynamics". Get these wrong and you'll get people arguing with you, heckling and general hostility. Get these right, on the other hand, and you're virtually guaranteed a successful result. With you new control of "Group Dynamics" you'll be amazed at how easily you can attract and hold people's attention. You'll find people drawn to you and open to your influence. And that's even without applying the insider secrets of. In this third session you'll discover how to really shine as a group hypnotist. You see, it's not just about what you say but how you go about saying it. And there are simple, but very effective, ways you can keep the attention of an audience and guarantee that you will get your message across. The session concludes with a summary of how to put everything together in one devastatingly effective hypnotic presentation (with a step-by-step map that's easy to follow). 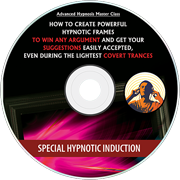 You'll have the power to confidently address any group and use your covert hypnotic abilities to get the result you desire. Imagine what you can do with this new power. Now, as well as the training audio sessions, you also get a "Quick Start Executive Manual" in PDF format that recaps the key points from the program. It also gives you an easy way to refer back to a particular section at any time. "I Had 100% Closing Ratio Today! Thank You. Thank You. Thank You!" ￼ “I spent all weekend listening to the audios and studying the material. 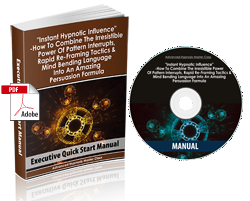 I'm soooo excited to implement the hypnotic suggestions in my sales presentations which I give Realtors all over the country selling a marketing package. I was AMAZED at the things I was doing totally wrong and have since revamped my presentation to be more efficient and look forward to increased sales. This product has literally resparked my passion for what I've been doing for 10 years now. UPDATE: “Oh My God!!! EVERY SINGLE agent bought my marketing today!!! My presentation was fresh and exciting...even to me! 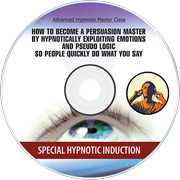 Thanks to your Group Conversational Hypnosis CD course, I had 100% closing ratio today! Thank you. Thank you. Thank you! I have a renewed passion for my business and can't wait to share what I've learned with my friends and family. "How To Create Powerful Hypnotic Frames To Win Any Argument And Get Your Suggestions Easily Accepted, Even During The Lightest Covert Trances"
In this first session, you'll discover how frames control the meaning of a conversation or any form of communication. With this control, you can win hearts and minds, add great power to your suggestions and easily get the results you want. In our society, science has an enormous amount of credibility and authority. In many cases, people will believe something simply because a "scientist" said so. You can take advantage of this to present your suggestions in a way that appears "scientific". When you do this, people will easily agree with you and accept your directions. This second session reveals exactly how to do this. The truth that lies behind many superstitions but why for most people they make no sense at all (plus the root cause of phobias). You can often use this to appear to create "magic"
In this third session you'll add advanced covert tactics to your foundation knowledge. With these at your command and used correctly, it will be almost impossible for someone to resist you. At the end of these 3 sessions, you'll have a deeper understanding and command of hypnosis and hypnotic frames than even some so-called experts. Even better, you can use your new command of these advanced psychological tactics to be a more accomplished and effective hypnotist. "You Won't Find Anything Close To As Powerful As What Igor Has Put Together In This Masterclass"
"As a therapist and continual student of quality information, I can tell you that you won't find anything close to as powerful as what Igor has put together in this masterclass. "It is true that if you were only going to learn one concept, frame control would be your most valuable and beneficial knowledge. If you don't have this right, everything else doesn't work as well, it's as simple as that. "After hearing the information, one cannot help but make immediate changes to their personal and professional lives for the better." "How To Make A Lot Of Money With Hypnosis - Either Part Time Or Full Time!" ...is in the preparation. To set up everything beforehand. And I set out exactly what to do so that by the time a client comes in for their session, you're virtually guaranteed of success. With this correct preparation, you've set the scene for success. In this second session we get to the heart of the matter where I reveal a virtually foolproof way to run a stop smoking session with a client. You get the benefit of my years of experience with a proven system that's easy to follow. 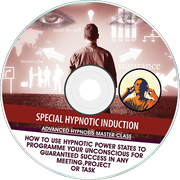 3 inductions to put your clients into a trance quickly and easily. Most of the time they'll be in a trance and under your spell before they even realise what's happening! With this template (and a little practice) you'll quickly be conducting stop smoking sessions with flair and confidence. In this final session, I share with you the insider secrets that make the difference between you enjoying a life of wealth and success and simply getting by (or even struggling). You see, it's not enough to simply be good at hypnosis. You need to attract clients and charge them appropriately for the very valuable service you're providing. And it is valuable. The amount they will pay you is a trifle compared to the value they'll get from stopping smoking or changing a similar destructive behaviour. Remember, as well, that for many years I ran my own very successful practice. What I share with you is based on proven strategies...not untested theories. 2 ways to get an ongoing stream of business from every client - even if you only ever see them for one consultation! With this simple and effective system in place, you'll never have to worry about where to find your next client. The biggest problem is likely to be how to meet the demand for your services! With this third audio session, you now have everything you need to set up, get started and make money as a stop smoking hypnotherapist. And remember, you don't have to limit yourself to stop smoking sessions. The techniques and strategies work equally well for other problems (such as weight loss or phobias). A special Relaxation hypnosis session. You can use this with your clients as well as for your own benefit. So, follow the simple steps laid out for you and sooner than you think you'll have your first client and be banking your first fee. ...and all from doing something that you love and is of great benefit to the world. "Follow This System And You Can't Fail"
"This master class is brilliant. Packed full of useful information regarding setting up and running a stop smoking hypnotherapy business, including the therapy itself. "Before I got this master class I was surprised if any clients actually stopped smoking, now I am surprised if they need to come back for my free follow up session. "I would strongly recommend this master class to any budding hypnotherapist and the experienced hypnotist alike. "Follow this system and you can't fail." "Secrets To Creating Hypnotic Magic Moments That Will Captivate People's Attention, Win People's Hearts, And Change Their Minds In A Instant"
In this first section, you'll discover what Magic Moments are and how they work to bypass a person's "Critical Factor". Getting past that "Critical Factor" is, of course, an essential step in hypnosis...enabling you to get your suggestions accepted. 3 big mistakes to avoid and 5 tips to making the Magic Moment truly "magical"
4 ways to convert a Magic Moment into a hypnotic experience so that you can put someone under your spell without them realizing what's happened! ...plus a simple way to make a coin vanish (anyone can do this and it will astonish an audience). ...when you start it's always helpful to have some examples to model and adapt. Hot Rubber: How to take a simple rubber band and miraculously make it feel red hot! The Butterfly Effect: No...it's nothing to do with hurricanes...although don't be surprised if there's a storm of applause when you perform this illusion! Psychological Mind Game #1 The Party: Here's a fun and simple exercise that will have people staring in amazement as you reveal things about them they thought only close friends and family would know! Just by having these 10 simple patterns at your command, you'll be able to enchant and captivate people at will. What if you could peak inside someone's mind and read their thoughts and feelings? How about glimpsing past events, present concerns or their hopes for the future? If you could do that, creating Magic Moments would be easy. And that's what Hypnotic Mind Reading is all about. ...and bypass their Critical Factor. And when you do that, they become very open to your suggestions and influence. In this section, you'll discover how to conduct a simple 2 minute character reading. You'll "read" someone's mind and captivate them with your amazing insights. It's easy to learn, quick to do and very impressive! Hypnotic Mind Reading Pattern #3 - Covering All Possibilities. The secret to always being right about someone...no matter who they are! Hypnotic Mind Reading Pattern #4 - The Barnum Effect. Legendary showman P.T. Barnum used this pattern to great effect PLUS why this is so potent and how you can use the astrology section of your newspaper to boost your "mind reading" powers! ...PLUS you'll quickly get a reputation as being wise and insightful! ...that will captivate people's attention, win their hearts and change minds in an instant. Now, as well as the audio sessions, you also get a "Executive Quick-Start Manual" that recaps the key points from the class. It also gives you an easy way to refer back to a particular section at any time. 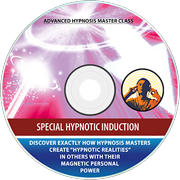 A Special Hypnotic Induction To Make You A Master of "Magic Moments"
“Delightful demonstrations which are easily mastered and wonderfully effective. "How To Become A Persuasion Master By Hypnotically Exploiting Emotions And Pseudo Logic So People Quickly Do What You Say"
In this first session, you'll discover exactly how and why influence works (and, conversely, why your efforts can fail) along with a foolproof roadmap to follow in any situation. You see, emotional appeals work most effectively when you've prepared the approach carefully in advance. 17 killer tactics in covert influence reasoning. With this repertoire at your command, you'll be irresistible in virtually any situation! As you've discovered, the real key to influence is understanding emotions and the powerful role they play in our lives. It's important to fully understand negative emotions as well as positive. In fact negative emotions can often be much more powerful in motivating someone to take action. Warning! Avoid these mistakes or you'll find that using Pity, Kindness and Admiration will backfire on you badly. A dirty little secret that exploits the desire for a "quiet life"
The secret protocol of legendary hypnotist Milton Erickson. He used to get people to do the most bizarre things...and nobody ever understood how he did it. Now it's revealed so that you can understand and repeat his amazing feats of covert influence. ...your powers of hypnotic influence will reach new heights! Now, as well as the training sessions, you also get a Executive Quickstart Manual that recaps the key points from the class. It also gives you an easy way to refer back to a particular section at any time. “This powerful technique quickly produces hypnotic phenomenon with people easily in a manner that is undeniable and irresistible. 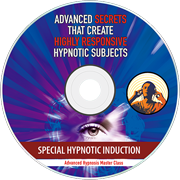 "Advanced Secrets That Create Highly Responsive Hypnotic Subjects"
To allow someone to access the full range of hypnotic experiences, you need special tools, principles, strategies. In this first session, you'll get the basic tools to get started training highly responsive hypnotic subjects. ...so that they get to experience the benefits and your reputation as a dynamite hypnotist grows! After covering the key fundamentals the greater part of this session contains a guided demonstration of exactly how to conduct a training session. ...AND be able to help anyone enjoy wonderful hypnotic experiences (people will love you for this gift). ...and allow you to demonstrate your amazing hypnotic powers! "Automatically Install The Attitudes & Techniques Of A Master Hypnotist With The Hypnotic Hero's Journey"
This program is designed specifically for “speed freak” type people who have no time to mess around. See the genius of Igor's training is it AUTOMATICALLY “downloads” into you the ability to perform amazing hypnosis feats that would ordinarily take you years of blood, sweat and tears to master in the conventional way. There's no thinking... effort... or struggle needed on your part. You just need to listen to Igor's guided imagery and powerful multi-loop, stacked-metaphor induction called the “Hero's Journey”. And Igor will literally hypnotize you into becoming a master hypnotist. ...PLUS mistakes to avoid (such as the temptation of the "Dark Side"). ...PLUS the traps and blind alleys to steer clear of on your journey. Now, as well as the special hypnotic hero's journey training, you also get an "Executive Quickstart Manual" that recaps the key points of the journey. It also gives you an easy way to refer back to a particular section at any time. ￼ "The best masterclass ever! It totally transformed me from a basic hypnotist who's focused on learning techniques, to an advanced one who is creating his own style, inductions, variations of other hypnotic processes. Just leave it up to your unconscious mind and forget about the whole thing and let the magic operate. The key to mastering hypnosis is inside each one of us, and this masterclass helped me find mine." 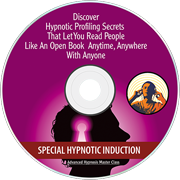 "Discover Hypnotic Profiling Secrets That Let You Read People Like An Open Book Anytime, Anywhere With Anyone." You won’t literally be able to know every thought going on in someone else’s head. I don’t want to mislead you into thinking that. But with my profiling secrets you will be able to run a kind of “intuitive MRI scan” through the mind of the person you are communicating with – and get a very good feel for their pattern of thinking. Hypnotic profiling is a remarkable tool that allows you to predict someone's behaviour and understand them so well that everything you say can have the force of hypnotic suggestion. It's all about understanding and recognising different types of personality and the corresponding different types of behaviour. When you fine tune your awareness and can recognise different patterns, that's when you have such insight that it seems like you can read someone's mind. The 4 basic personality types are highly useful. But, of course, they are only rough character sketches. After all, every individual is unique. In this session, you'll discover how to build on the primary personality types and create unique profiles to describe (and understand) the diversity in people's characters that you see in the real world. 2 elements to crafting a convincing argument and how to use your knowledge of personality to hit all the right "hot buttons"
...PLUS a comprehensive reference guide to the main psychometric tests and how they relate to the elemental character types. You'll find this invaluable in developing your skills and ability to read people like a book. Now, as well as the 7+ hours of in-depth training, you also get an "Executive Quick-Start Manual" on PDF that recaps the key points from the class. It also gives you an easy way to refer back to a particular section at any time. "If You Have To Deal With People...And Who Doesn't...This Is A Must Have!" "If you are a fan of the show "The Mentalist" this is straight up learning how to read people/see through them. I learned so much from Igor in this Master Class that is applicable to so many different areas of life. If you have to deal with people...and who doesn't...this is a must have!" "Discover The Secret Hypnotic Art Of Hiding Commands Within Parallel Realities So Your Conversations & Ideas Quickly Change People Forever." If you want to be a master of Reframing then you need to start with a thorough understanding of how Frames work and how they come about in the first place. Credit for discovering how to use embedded commands, and how astonishingly effective they can be, goes to hypnosis legend Milton Erickson. Early in his career he found that he could hide suggestions inside what otherwise seemed ordinary conversations. ...PLUS some simple (but effective) ways to become polished and confident with embedded commands very quickly. ...but as you've discovered it's simply using puns, word play and metaphors to talk about the "real world" indirectly. And when you do this, your powers of influence and your ability to create beneficial changes in people increases. How you can use stories as a special kind of parallel reality and a journey with Milton Erickson inside a "Boiler Factory"
In the previous section we touched on the idea of the "Hypnotic Monologue" - simply a description of something or a reasoned logical argument. In fact, it's a highly effective vehicle to deliver compelling, embedded commands. You'll now know exactly how to conjure up a parallel reality at will and be able to add potent hypnotic commands completely undetected. "Really Sound Advice And Excellent Working Principles"
“This masterclass was full of really sound advice and excellent working principles. Rapid Reframing "Instant Hypnotic Influence"
"How To Combine The Irresistible Power Of Pattern Interrupts, Rapid Re-Framing Tactics & Mind Bending Language Into An Amazing Persuasion Formula"
...we make sense of things by referring to other things that we know about. ...PLUS you get a copy of a classic piece of literature called "The Gorgias". This work from Ancient Greece is an elegant example of reframing in action. Even after 2,407 years, it contains valuable lessons for you in persuasion and subtle influence. In this session, you'll discover some troubleshooting tips, be introduced to the highly useful "Meta Model" and get started with the 19 Rapid Reframes that will solve pretty much any situation you're likely to encounter. At the conclusion of this session, you'll have everything you need to be able to rapidly use reframing to perform dazzling feats of persuasion and transformation. "Helped Me A Lot With A Lot In My Career And In My Daily Life"
“I really want to congratulate you for this masterpiece, because it’s very effective and powerful in the term of influences and reframing, and it helped me a lot with a lot in my career and in my daily life. If you want to equip yourself with the very best library of hypnosis knowledge, training and demonstration then you need to own ALL 21 of my advanced hypnosis masterclasses. Normally you'd have to invest $197 for each masterclass which is $4,137 for all 21 masterclasses. However you can now, from this page only, get all my advanced hypnosis masterclass for just $69 each! That's a huge "complete library 65% OFF Discount" saving you $2668! ...you can even split this up with 9 simple monthy instalments of just $161. That’s 9 simple monthly instalments of $161 to equip yourself with all 21 masterclasses and have at your fingertips the world’s best library of hypnosis information, training and demonstration that can be applied in real-life hypnosis situations. That’s much cheaper than buying up an endless number of incomplete hypnosis books and courses on Amazon or Barnes & Noble. And it will save you hours and hours of time too. For me, whenever I want to learn a subject I will invest more to get all the information and training from the person who can break it all down and explain and teach it all in a simple “Oh I see... I get it now!” way. After all, there’s nothing more costly or frustrating than paying for information that leaves you cold, with more questions than answers. Anyway, this "complete library 65% Discount OFF offer" for all 21 of my advanced hypnosis masterclasses is time-limited. That's because I have already taken down all the pages where you could get my masterclasses individually as they are no longer available to own like that. Plus I reserve the right to cancel this special promotion at any-time and remove the $2668 discount. 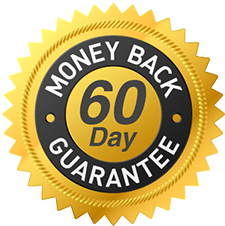 Of course you also get a 60 day 100% satisfaction money-back guarantee on the complete library. I realise this is now the only place that I can get access to Igor's 21 Advanced Hypnosis Masterclasses. And I’m taking advantage of this exciting opportunity. I will get instant online access to this library of 21 Advanced Hypnosis Masterclasses in my private members area. This library is equal to almost 200 CDs of training, special inductions and executive quick-start manuals! I'll be able to download (or stream) from my online members area any advanced masterclass I want, when I want, on any computer, laptop, tablet or smart phone. 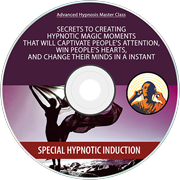 I have 60 full days with a 100% satisfaction guarantee to try out this complete advanced hypnosis masterclass library. If I'm not totally happy during these 60 days, I can get a prompt 100% refund. No questions asked. P.S. Here is a tiny selection of the 1000's of testimonials I have on file for my advanced hypnosis masterclasses..
"Gained 6 New Clients In ONE WEEK! Amazing!" “I've recently purchased this program and I must say I was delighted and thrilled at the same time learning about this very comprehensive and compact action plan. "I would like to say to everyone that might still be in doubt about whether or not to buy this set: do it! You will not be disappointed! “I have just finished listening to the Advanced Master Class - Non-awareness set. I had very high expectations for this product after learning so much from Igor’s 'Power of Conversational Hypnosis' CD set. I think I have now learned one of the single most powerful tools that will elevate my skills to the realm of mastery! Every signal, feedback and so-called 'resistance' can be elegantly incorporated into a simple process to reach profound trance - the explanations, examples and live coaching really support the approach and the audio sessions were enjoyable to listen to. I have already begun incorporated it in conversational approaches and the results are just awesome! "If You Are Serious About Learning Hypnosis..."
“This is a great course. It has really helped me outside of my clinic as well as inside. I think the step by step approach of Igor is great and a real help to have the quick start manual too so you can pick it up any time. "One Powerful Set Of Skills"
“For now I think the ideas presented in this master class about covert influence are the best information ever found. "Learning Techniques Are Cutting Edge"
“Someday, when I meet Igor at a live training somewhere, I would like for him to do me a favor- kick me! That's right! Kick me! For waiting so long to order Igor's courses. What was I thinking?! Right now I am going through the 'hypnotic power states' class and I am blown away at how awesome it is. 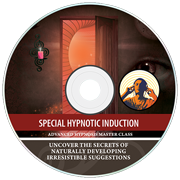 Not only is the course material easy to remember but Igor includes hypnotic inductions to make sure you can create the 'hypnotist's power state' in yourself any time you need it! You can't fail! Igor's advanced learning techniques are cutting edge. I would have never thought that learning hypnosis is this easy and this much fun! Not to mention all the people I can help to live a better life. "This Master Class Was A Godsend To Me"
“Have you ever been in a situation where someone says something challenging or downright confrontational, and then you find yourself put on the defensive for the rest of the conversation? I sure have been and so this master class was a godsend to me. "Will Make You A Master Storyteller In No Time"
“Igor's master class on storytelling is magnificent! "Never have I ever heard as many drills and exercises for improving your storytelling skills from basic performance skills to improvisational storytelling to advanced storytelling techniques such as nested loops! "My Ability To Tell Hypnotic Stories Has Increased Exponentially"
“After listening to this class not only do I have a deeper understanding of how and why stories can be so captivating but my ability to tell hypnotic stories has increased exponentially. "This class is great for the art of storytelling. "Years Of Study In Hours"
" Living In An Amazing Reality"
Magnetic Personal Power is an amazing masterclass. It's not that you or I don't already have personal power; it's that we may not always be the best at tapping into the resource. This masterclass empowered me to tap into those resources more often so I experience even more of living in an amazing reality and inviting others to come be amazing, too, so they're magnetically attracted to me." 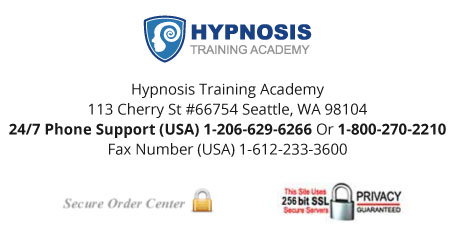 "This program provides usable information, practice suggestions, and inductions to help me integrate and learn ways to be a more effective and competent hypnotist. I use the distraction suggestions in my work when my clients are resistant to change. Igor's training is powerful and effective. Thank you Igor!" "If You Apply It You Will Have Amazing Results"
"The Best Real-World Skill That I've Seen So Far"
“Igor you are such an inspiration! 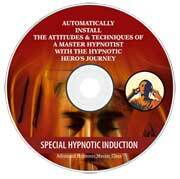 I was amazed watching you talk on topic (for 15 DVDs) during the Conversational Hypnotherapy training program. That was the first time I'd seen you on video. Now you're telling us on this master class how you prepare yourself and carry out your presentations. And it's something we can actually do without being geniuses! There are lots of places I want to use the flow state. These techniques are brilliant! I just received this class and have listened to segments 1 and 2. Can't wait to learn about accelerated learning in the final segment! All your master classes are applicable to everyday life but this one is the best real-world skill that I've seen so far. "Igor's Hypnotic Induction Gathers The Material Together And Forcefully Makes The Material Part Of The Learner's Life From Now On." “Igor's master class on the dynamic principal is a massively meaningful exposition of the range of active and passive; overt and covert hypnosis practices and principles. "The telephone participation of hypnosis students who serve as both subjects and audience brings the material alive.